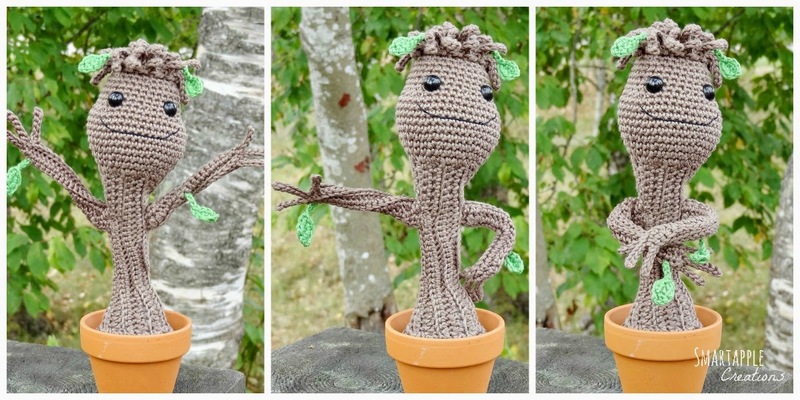 My crocheted baby Groot inspired by the Marvel movie "Guardians of the Galaxy" turned out to be quite popular and many people have asked for the pattern. I decided to postpone my other crocheting plans for few days and made a free pattern for you. I am sure many people wait Marvel to come up with an original dancing baby Groot toy but if you can't wait that long, make your own. Baby Groot is so adorable, who would not want one or maybe even two! If you have not yet seen the movie then do it soon. It is awsome! After seeing it you definately want a baby Groot of your own. Amigurumi baby Groot is as cute as the original and makes you smile every time you look at him. You can change his dance poses because there is wire hidden inside his body and arms. He is about 20 cm (8 inches) tall if using similar yarn. The difficulty of the pattern is advanced beginner to intermediate. Here comes the pattern, happy crocheting! UPDATE! The Baby Groot pattern is now also available in German. Minu amigurumi beebi Groot, mis on inspireeritud filmist Galaktika valvurid, osutus üllatavalt populaarseks ning paljud inimesed on küsinud minult selle heegeldamise juhendit. Otsustasin hetkel siis oma muud heegeldamise plaanid edasi lükata ning tegin juhendi valmis. Ma ei ole kindel, kui populaarne see film Eestis juba on. Kuna Ameerikas on see väga populaarne, siis hetkel on juhend ainult inglise keeles. Kui armastad fantaasiafilme, siis soovitan kindlasti Galaktika valvurite filmi ära vaadata. Pärast tahad kindlasti endale ka ühte pisikest beebi Grooti poti sees. Pisike Groot on väga armastusväärne ja teda vaadates tuleb kohe naeratus näole. Tema tantsupoose saab muuta, sest keha ja käte sisse on peidetud traat. Ta on 20 cm pikk, kui kasutada samasugust lõnga. 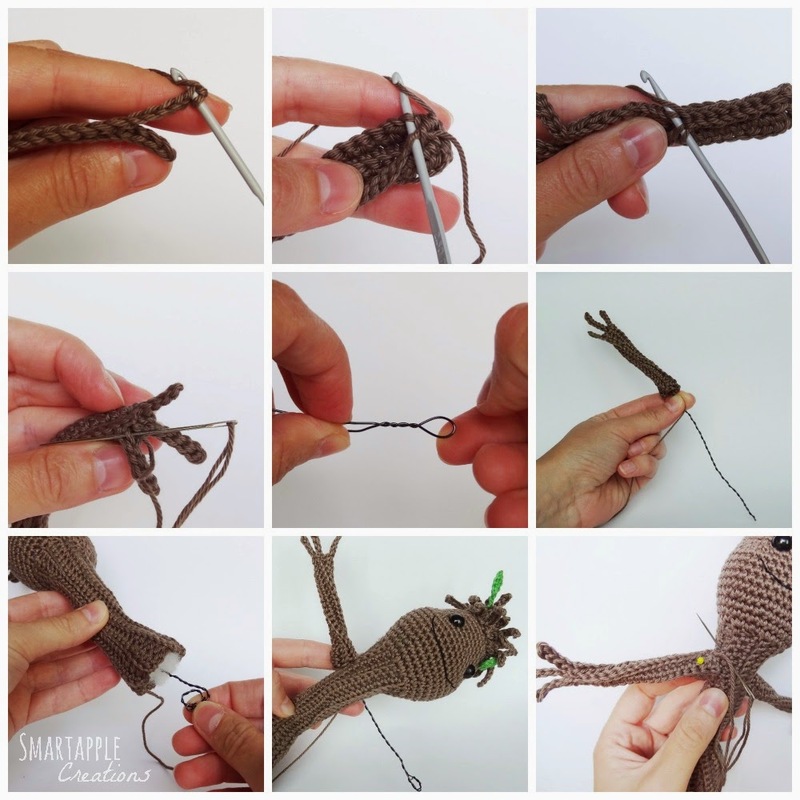 Juhend on sobilik juba kogenumale algajale või keskmise tasemega amigurumi meisterdajale. Important! It is prohibited to sell the pattern, you are welcome to share the pattern on your website or blog if you credit Smartapple Creations as the designer and add a link to my website http://smartapplecreations.blogspot.com. If you would like to translate the pattern, you need to ask for my permission first. Note that this is a popular figure and holds a copyright by its original creator. I share the pattern for free and for personal use only. Other actions are on your responsibility. - Crochet with tight stitches. To avoid holes, use a smaller hook. 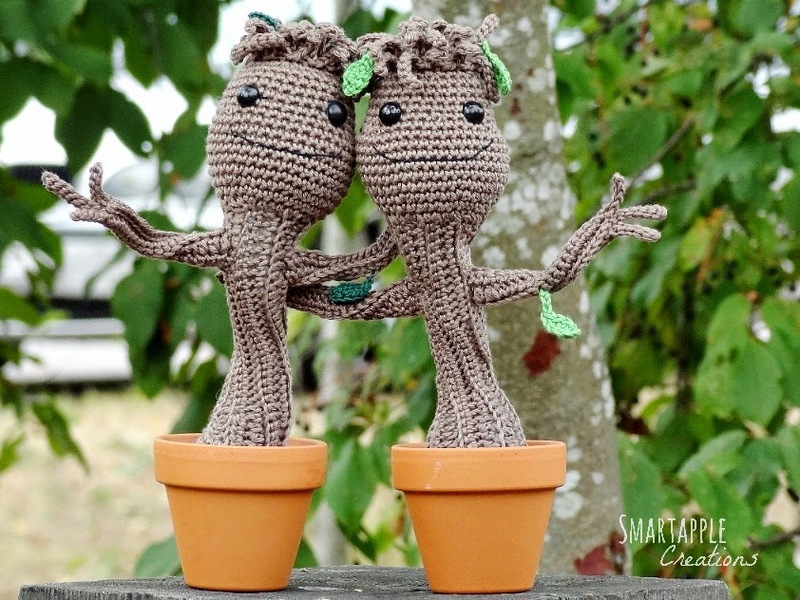 -You can make a larger or smaller baby Groot using bulkier or finer yarn, adjust the size of the crochet hook and safety eyes accordingly. Use a crochet hook at least a size or size and half smaller that suggested on yarn label. chain stitch, slip stitch, single crochet stitch, half double crochet stitch, increasing, regular decreasing, invisible decreasing, crocheting in rounds, crocheting through back loops or front loops only. - Crochet the whole piece through back loops only to achieve the ribbed look. Fold the piece into half so that R1 is in the front and opening is on the top. To make the piece into a tube crochet R1 and R13 together with 30slst (R13 through back loops only). Do not fasten off the yarn. Continue to crochet the head. - Crochet in a continous spiral, do not join rounds or turn. 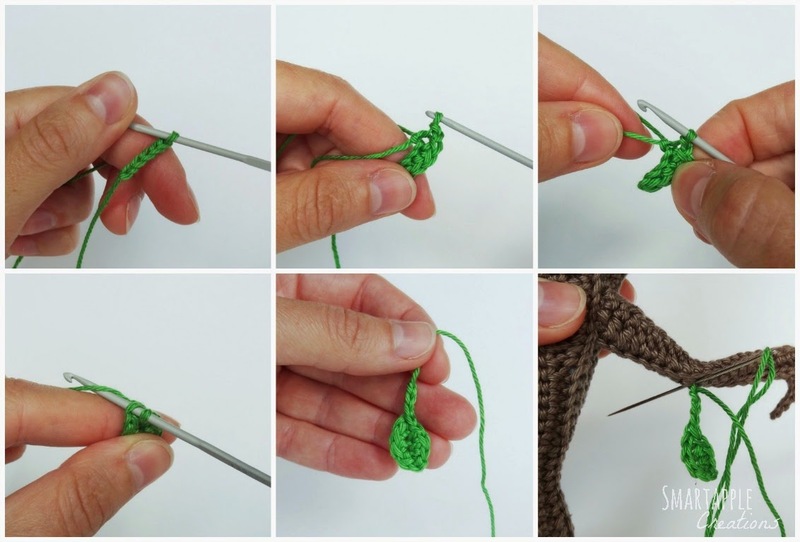 - Use a stitch marker or a piece of yarn to mark the end of the row. - Crochet through both loops unless stated otherwise. R1: Ch1, pick up 30 sc in this row. For that make [inc] x2 to the first spacing between the ribs, then inc in each rib and each spacing, again [inc] x2 to the sixth spacing and again inc to each rib and spacing until you have 30 sts. Insert the safety eyes between rows 11 and 12 by leaving 7 sts (6 holes) between them. Fasten with the washers tightly. Continue to make the hair. Make one last spike to the top of the head: ch6, 5slst along the chain and fasten with a slst into the next sc. Fasten off. Sew the hole closed on the top of the head, aga hide the yarn end inside the head. Embroider the smiling mouth with black embroidery floss (the mouth is 13 sts wide and between rows 6-9). Hide the yarn ends inside the head. Fold the piece into half so that R1 is in the front and opening is on the top. To make the piece into a tube crochet R1 and R5 together with 19slst up to the fingers (R5 through back loops only). Fasten off and leave a long tail for sewing. Do not stuff the arm. Sew the hole closed in the jointing of arm and hand and bring the yarn through the arm and through the hole on the other side (you will use it to sew on the arm). To make your Groot poseable put some wire inside the arms and body. I had some 0,5 mm copper wire at home. For the arms I cut a piece of wire about 38 cm / 15 inches (twice the length of two arms plus width of the body). I folded it into half and winded it together to a spiral leaving a small loop to the top. As my wire was so thin I made it stronger that way. Insert the end of the wire into one arm, bring the wire through the body where you want the arms to position. Make a loop to the other end of the wire and insert it into the second arm. Attach the arms with some sewing pins to find the right position and sew them on. For the body I cut a piece 2 times the length of the Groot plus a couple of extra cm/inches and winded it into a spiral the same way. Insert it into the stuffed body so that the upper loop reaches the head and bend the lower part also into a loop. An inch / a couple of centimeters of the lower part should stick out. It will be hidden inside the soil ball. Ch5 (count the slip knot as the first ch), slst in the next ch from the hook, 2sc, 3slst into the first ch (pull the first ch tight by pulling the yarn end and continue to crochet the other side of the chain), 2sc, slst. Join the round with a slst into the first slst, ch3. Fasten off and leave a yarn end long enough for sewing, hide the starting yarn end inside the leaf. Sew the leaves on to both arms and two leaves on to the head. - The soil ball is made for a flower pot with a diameter of 6 cm (2.4 inches) on the top. If you have a smaller / larger pot, adjust the increasing and decreasing accordingly. 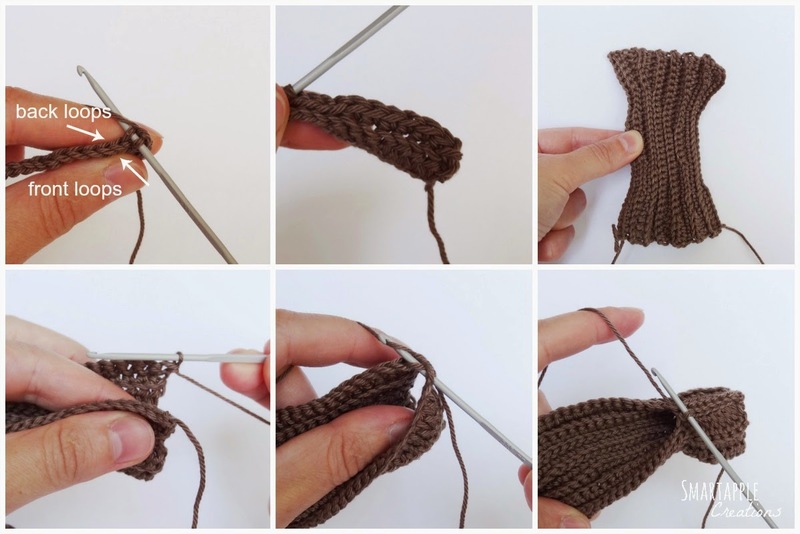 - Crochet through both loops. Fasten off, sew the hole closed and hide the yarn end inside. 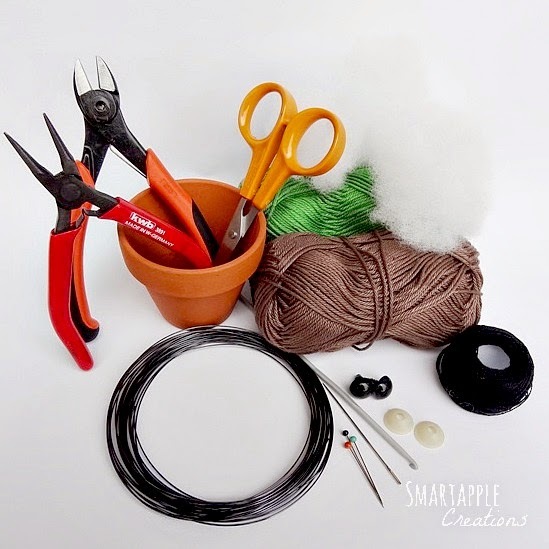 You can glue the soil ball to the pot or add some pretty stones on the top to make sure your baby Groot will not fall out. Congratulations, you are now a proud owner of a baby Groot! If you liked this pattern check out also my pattern stores on Ravelry and Craftsy for my other cute patterns. Follow me also on Facebook or Instagram. If you have any questions or comments to the pattern do not hesitate to send me an e-mail or write in the comments below. I would love to see how your baby Groot turned out. Please send the pictures to me by email or share them on my Facebook page for others to enjoy as well! I love thiss!! Thank u sooooo much!! Thank you so much for sharing your wonderful pattern, I have an 11yr old who can't wait for me to crochet 1 for him, thank you again. He will love it, I am sure! This is just adorable! What a creative pattern; great job on it! Thank you for sharing this pattern! I will definitely try to make it. Im a bit confused at the first step on the head. Is there a simpler way to put it? After you have finished the body you will have a round on the top. Now you need to crochet 30 single crochet stitches to this round. As this was previously the edge you do not have proper stitches where to make the single crochet stitches. You crochet the edge over and divide the 30 sc as evenly as you can in the first round. The body has a ribbed texture and I increased in every rib and in every spacing between the ribs, plus increased twice in two of the wider spacings. I hope you can understand what I mean. Let me know. Lovely pattern! What gauge wire did you use? Many thanks! Thank you! I had some wire at home but I could not find the label, I had misplaced it somewhere. I suppose it might have been 0.5 mm wire. But the gauge is not that important, you can use thicker wire. With a thicker wire you probably do not need to wind it into a spiral, just make loops to both ends. In this row first you make 8 single crochet stitches, then make one increase in both next stitches, then make 12 single crochet stitches and again one increase to both next stitches, then again 12 stitches. This is necessary for making the cheeks. Hi! In other words it means: 9sc, dec, 4sc, dec, 4sc, dec, 9sc, dec. See also the abbreviation section at the beginning. [dec, 4sc] x2 means that you repeat the instructions in the brackects two times. You are welcome, glad I could help. With R1 you actually make already your first finger (the first 3slst of R1 is the finger) and the fingers are not all the same lenght, the middle finger is slightly taller. After you have made the ch7 in R2, you start crocheting back along the chain (make your first slst into the second ch from the hook. The 6slst that you crochet along the chain will form the middle finger. R5 is the same: the first 4slst that you crochet back along the chain will form the third finger and everything else is the hand and the arm. I hope you understood, just follow the instructions and I am sure you will get it. thank you for this patern , my daughter will absolutely love it. Thank you Lyn! I am glad you liked the pattern. He is adorable! Thanks for sharing this with us! I'm so happy I found this! I love Groot! I'm not a Beginner, but I'm stuck at R4 of the Body. The way I'm understanding the Row is: Ch2, 4 Half Double Crochets, 2 single Crochet, 6 Slip Stitch, 4 Single Crochet & 2 Half Double Crochet (30sts Total). However, the Row ends up stopping 3/4 of the way across & when I count the Sts, it's only 18sts, not including the 2chs. Am I doing something wrong? If so, can you please explain it to me?? I'm making this for my Brother to put with all his Plants. I checked the instructions and you have missed a few stitches - after the first 6slst you need to make 6sc and another 6slst, then you will continue with 4sc and end with 2hdc. Row4 goes like this: ch2, 4hdc, 2sc, 6slst, 6sc, 6slst, 4sc, 2hdc. 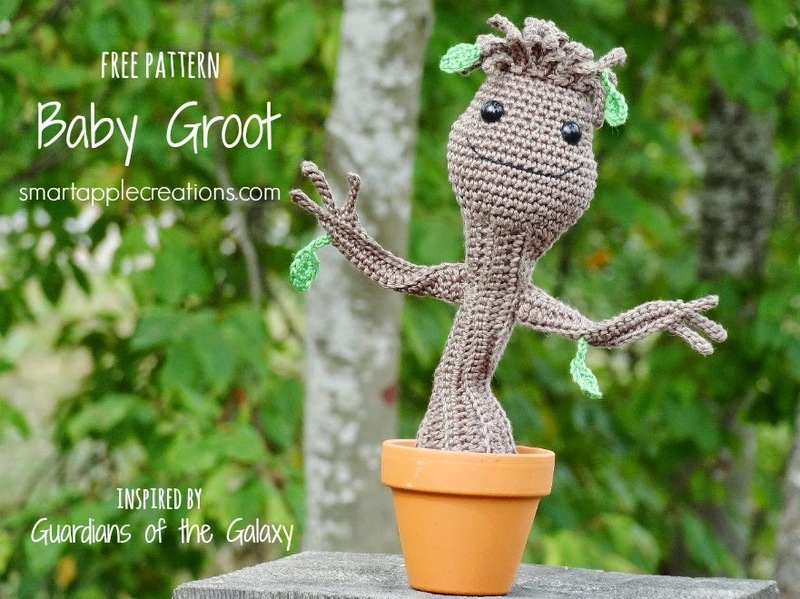 OMG I can't wait to make one and surprise my 9yo son - we both LOVE Groot and this pattern has him cracking moves AWESOME thanks so much !!! Thank you! I hope you enjoy the pattern.